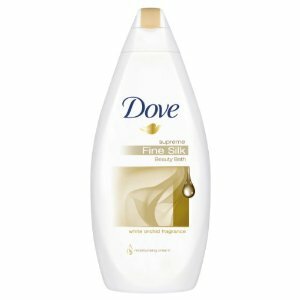 It was by Dove and called Dove Supreme Seta Preziosa. I bought a bottle when I was in Italy and treasured it once I found out I could not buy it online. When I started dating my girlfriend, she loved it too and almost used up the remainder of the bottle. I stowed what was left under the sink for special occasions, because really it smells that good and moisturizes like Dove does, exceptionally. Well, this year for my birthday Zoe surprised me with a bottle of this luxe body wash which her dad (who is awesome BTW) picked up when he was in Italy a few months ago. I jumped off the couch in excitement! So today when I was prepping this post for the Blog, I googled imaged searched the body wash and then folks, I found that you can buy it on Amazon. Amazon, people!